Welcome to our official suggestions forum. Do you have an idea? Do you recognize a good idea when you see one? We want to hear from you! I would like the good people at Icefilms to consider adding episodes from the latest season of Big Brother US, as it is my favorite summer time show! add an option for displaying the raw upload feed instead of only 'new' uploads? Previously this was the normal, but the flood of daily links often pushed some submissions off the bottom of the list before they were ever seen. But now the 'added' feed only displays movies which are 'new' to the database. New links to previously uploaded movies no longer appear on the chronological 'added' list. Even if the old links are now dead, or of lower resolution. Can please put back ipv6.icefilms.info, Icefilms URL is blocked in the UK or if you have alternative URL that works. It was working before the web server update. Thanks. Extension designed to obfuscate ad tracking by clicking every ad blocked by adblock hidden in the background. The side affect is that it simulates real clicks to ads, while no interaction of the user is required. Add a recent section for "popular" for the last 2 weeks or a month instead of all time. That way it would be easy to find recently uploaded blockbusters or other very popular content. Latest movies are not seen on the homepage. I wonder if there could be separate page for latest uploaded movies. Featured good movies but not all crap movies. Please do not use mkv for standard definition videos, it takes to much time and space. Thanks for your consideration. Use mp4 instead of mkv. If the video has 2.0, 2.1, 5.1 Sound. 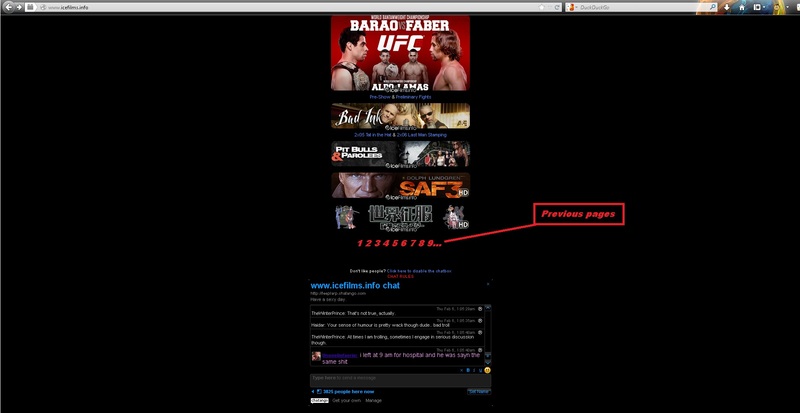 Have a header like "720P 2.0", "480P 5.1", "1080P 2.1"
Allow me to exclude shows from the homepage banners. allow me to remove a banner from the page of a type of show, for example "The only way is essex". I will never watch this show. When I've removed said listing, then add that to my blacklist (similar to how I add favorites now). Now when I go to the home page, I won't ever see that show in the main listing again. 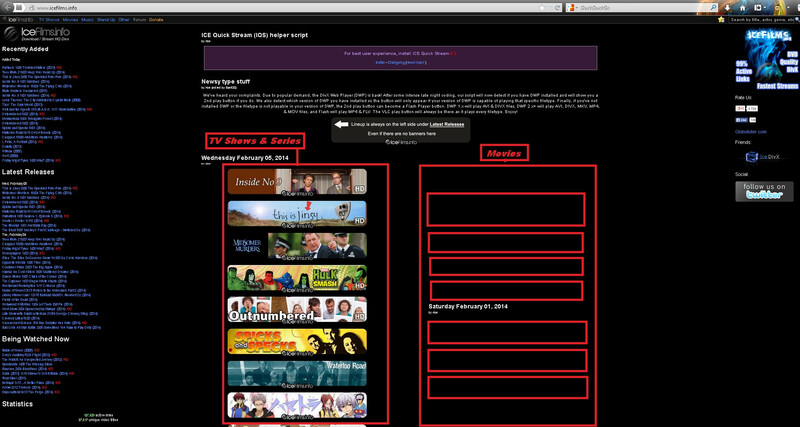 Over time, the main page will only list any shows I'm interested in, and any NEW shows that I haven't blacklisted. This will give me a chance to check out new shows, but doesn't force me to explicitly pick which shows to see. This also helps if I haven't been to the site in a few days to quickly see what I've missed. So this is literally the best website I've ever experienced and I wanna take it on the go so how about its own standalone app like I would even pay for this app as long as the site doesn't go down! Id like to request a show "In Search of Aliens"
Id like to see it on Icefilms if possible. First of all thank you for being my top 3 favorite website. For me the homepage with them awesome graphics of what is new always gets me at the first sight (at least thats what I'm checking daily), but sometimes when I'm gone for some time I miss everything. So these are my two suggestions, image friendly. Just read a few suggestions similar to mine about the columns. I'm sorry for repeating. Back before the big raid, when Megaupload was used so much it was a better choice. These new places used give out so many popups and it can be really hard to find the correct thing to click to get the file. I only suggest FileFactory because it's been one that I've used for 2 years now through Oliv3r forums (which are constantly down), and I've had nothing but smooth sailing and fast, hassle-free downloads.